For the sleepout to be added to your quote just book for 15 people then this will add the sleepout charge to your booking - The sleepout includes kitchenette/lounge, shower, toilet and separate bedroom with a double bed and 1 set of bunk beds. 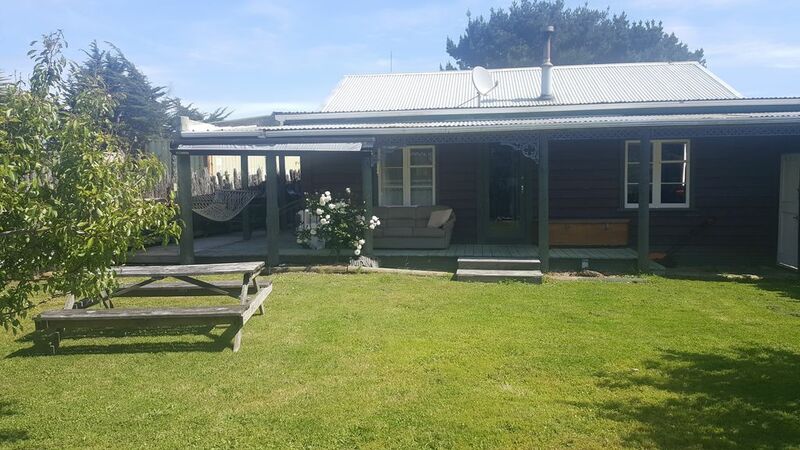 If you are looking for a good old fashioned kiwi bach holiday with friends and family then we think Whare Pukeko and Hokio Beach will be right for you. Relaxed and rustic batch living with lots of room to spend quality time with friends and whanau. A simple comfortable home that works well for both small and big groups. A gate at the driveway make this a safe spot for kids. Hokio Beach has a wonderfully remote feel and fishing and pipi gathering are popular activities here. Enjoy a pleasant walk following the Hokio Stream from the bridge down to the sea and kids will have a ball playing in the sand dunes. There are times when you will have the beach to yourself and here you really can walk for miles. On your way, you might find a driftwood house or perhaps build your own as it's another popular activity here. Switch off from your busy life and take a deep breath of fresh sea air. Miles of beach with 4wd vehicle access to the beach. Fishing. pipi gathering and whitebaiting during the season. Walking tracks. Levin Golf Club, Levin Adventure Park and Levin Aquatic Centre. Otaki has popular outlet shopping stores.10 minutes to the shops in Levin. Prior approval is required if you would like to bring your pet to Whare Pukeko. To include sleepout in the rental book for 15 guests which will add NZ$100.00 per night to your booking quote. Sleepout is only included in your rental if is on your quote. All beds are made up with a fitted sheet, and a duvet. There is 1 pillow with pillowcase per person. There is plenty of off street parking along the driveway. Well stocked, some basics for baking are also supplied. The kitchen is well supplied with all you will need. Tea towels and dishcloths are supplied. There is a Freeview decoder and a Chromecast device provided. There are board games and sports equipment for all ages. There is a toy box full of wooden blocks and various other toys available. The front lawn is fully fenced for children to play safely. We are so pleased you enjoyed your stay and enjoyed the house and Hokio as much as we do. We would be more than happy for you to stay again and thank you for leaving the bach so clean and tidy. You are most welcome. Please tell your friends and family. Hope to see you again soon. Back for the second time our family, kids + grandkids had a ball. The sun shone we played games inside and out. This batch housed the 10 of us perfectly, fenced and well equipped making a get away weekend too easy, Thanks! What a great property! Fully equipped with everything you need and more. Our whanau loved staying here and will be definitely be back! Lovely peaceful location with a fence to keep young kids safe. Lovely peaceful location with a fence to keep young kids safe. Beds were comfy and rooms were nice and dark, got a great sleep. Love the ?? A classic kiwi bach with everything you need . A classic kiwi bach with everything you need .We had such a fantastic time, perfect for little children too.